Try these tasty spinach substitutes when the weather gets hot. There are several spinach substitutes that can be grown in the hot summer months. Malabar Spinach, Basella alba is a tropical plant that is native to the Malabar region of India. It comes naturally with green leaves and yellow stems, but is also available in a red-stemmed variety, Basella alba 'Rubra' that is an attractive foliage plant as well as providing tasty greens that can be used in salads as well as stir-fry dishes. Be sure not to over-cook them because the leaves lose their texture and become slimy. The vines of this plant can easily grow to ten feet, and are relatively pest free. This is a tropical plant that loves the heat, so plant it outdoors in a sunny location after all danger of frost is past. It matures in 60 days, but leaves can be harvested before that. It is open-pollinated so you can also save the seeds. 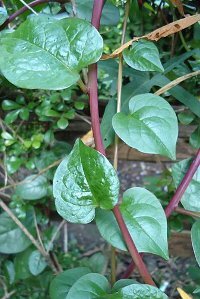 Another hot weather substitute is New Zealand Spinach, Tetragonia tetragonioides, is not true spinach either, but is a tasty, easy to grow substitute that will produce when it gets hot. This plant is native to many southern hemisphere Pacific-rim countries. It was discovered by Captain James Cook whose crew used it to help prevent scurvy. It is a low growing plant which spreads two to three feet across whose seeds can be directly sown just prior to the last frost. Soaking the seeds for a few hours in warm water will greatly aid in germination. It is also not bothered much by the usual garden pests. It likes full sun, but will benefit from some afternoon shade. Being open-pollinated, you can save the seeds for next year's crop.